Ferry Ibiza Formentera. How to get to the island of Formentera. home How to get? Where to sleep? What book? How to move? What to do? The first thing is to get to the island of Ibiza, located north of Formentera. To travel to Ibiza there are two options: plane or boat. Travel by airplane:Check the different flights from your area of origin to see if there is a possibility of direct flight, or need to make some kind of scale. In case of stopovers you may need to take several planes. The final destination should always be the island of Ibiza as it is impossible to reach Formentera directly by plane. Travel by boat:If you travel by boat you have four options: Departures from Barcelona, Valencia, Denia or Mallorca, always with the final goal the island of Ibiza. * Direct to Formentera: If you choose the option of going by boat, there is the possibility of going directly to Formentera without having to stop in Ibiza. Consult the company Balearia since in high season it places direct routes to Formentera with departures from Denia, Valencia and Mallorca. Keep in mind that these journeys usually vary every year, so before planning the direct trip to Formentera by boat, check with your agency or directly at the shipping company. If you have reached the island of Ibiza by boat, you may find yourself in two different places: the port of San Antonio or the main port of Ibiza town. If you are in the main port of Ibiza Town you can walk to the Maritime Station of boats to Formentera, where you can directly take your ferry direct to Formentera. I arrived by plane:Ibiza only has one airport so the way to go is always the same in case of traveling by plane. Since the airport as you leave, on the right is the bus stop, it is number 10, it leaves every 30 minutes and takes about 30 minutes, costs approximately 3.20 € and leaves you 200 meters from the Maritime Station of boats to Formentera. The second option is to take a taxi that will take approximately 15-20 minutes and will cost from € 10 to € 20 depending on the season and traffic. Perfect! We are already in the Maritime Station of boats to Formentera. Now we just have to take the ferry and in 25-30 minutes we will finally be starting our holiday on the island of Formentera. 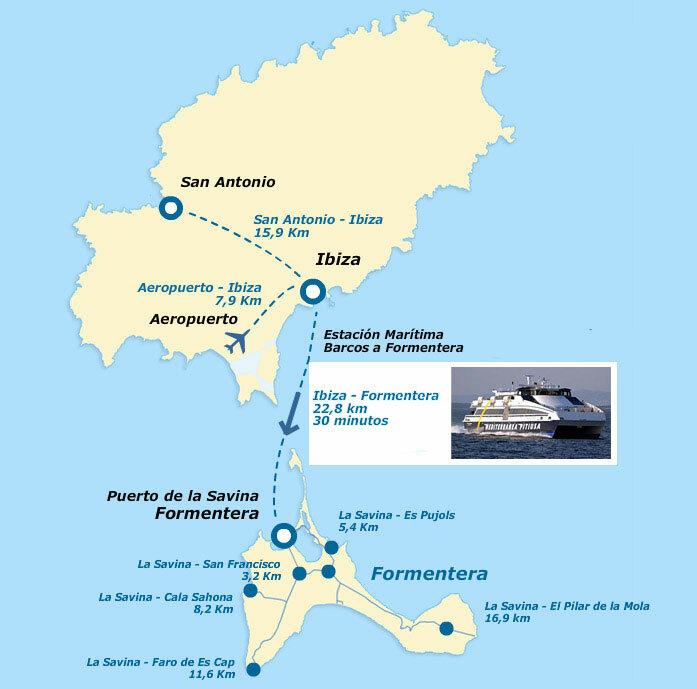 The ferry ticket to Formentera can be purchased at the port's ticket office without problems, but to ensure you do not have to wait in lines or wait and take advantage of special discounts of up to 6.25%, it is much better to make your reservation online. This way, when you get to the port you can go directly to the first ferry that goes to Formentera, without having to wait, or go through the ticket office and paying the guaranteed minimum price. In summer season from May to October a ferry leaves every 30 minutes towards Formentera, for low season you have to check schedules as the frequency of ferries drops considerably, although they are still fairly regular, but the big difference is that the last Ferry to Formentera is much earlier than in summer that there are ferries practically until midnight. * All companies allow you to book the round trip day with open schedules. they are from May to October. Formentera's Flower Power parties are one of the most anticipated and well-known events of the summer. Complete calendar of all hippie markets, artistic markets. Throughout the summer season there is live music almost every day in the squares. Calendar of popular festivals and holidays related to the island of Formentera. Exhibitions, events, cinema, theater... All the cultural and leisure agenda of the island of Formentera.